This topic contains 24 replies, has 3 voices, and was last updated by Nayem 3 years, 7 months ago. Just noticed that the date field on front-end is not even working. No matter what date/time you choose, it always saves as the current date/time on your computer. Can you please take a look what is going on with this? Please see the screenshot above. 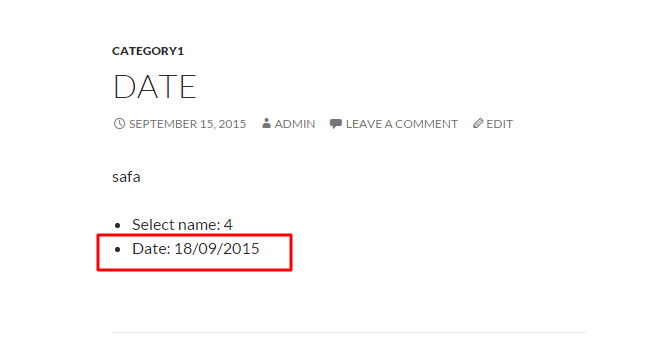 It saves correctly on date under custom field but not on actual post(Published on). How do I make it to actually change the published date on the post?? (That's how the previous version worked). I am experiencing the same problem on my site, where i am trying to set up an auktion based marketplace. this problem is therefore crucial to me. Hope we can find some help! Yes, you are right. I got this issue. But I have to discuss with my developer before providing any solution to you. Please allow me some time. Did you change any code in render-form.php file? Because In our latest version I did not get the issue. I saw that in another topic you were talking about custom date feature. So please make sure that you did not change anything in your code. I did change it to the code you guys gave me and found it has another issue (does not update date). I ended up reverting back to what is was. Please update to the latest version which is v2.3.9. We did not get this issue in our latest version. Please check and let me know. v2.3.9 does not fix the issue. Please see http://grab.by/Kkf8 to see what the issue is. Date field is actually working. However, it does not update ACTUAL PUBLISHED DATE on the post. Instead it just adds date on custom field. It seems to be a BUG not a wrong set up on my site cause this is happening on your demo site too. I have checked in the latest version but did not get this issue- http://i.imgur.com/qYfEe7g.png. So, I have to check your site. Please provide your login details and FtP details. YES!!! it is happening on your site. The date you highlighted red is date under custom field, the actual published date for that post is still SEPTEMBER 15, 2015. Please see the section with BLUE border. This is the screenshot you have posted.